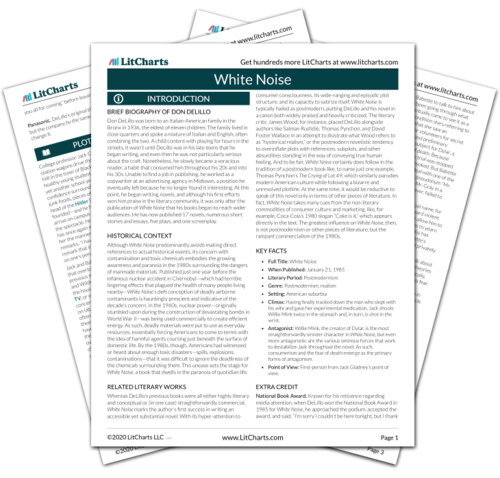 Instant downloads of all 945 LitChart PDFs (including White Noise). The Treadwells’ ghastly mall experience is the absurd and comedic epitome of consumer culture’s antagonism: its ability to alienate anybody who exists outside its influence. Trapped in a place dedicated to advertising and material consumption, the two old-timers appear unable to interface with the contemporary American world—they are “helpless” and “adrift,” unfamiliar with the “remote” “landscape” of the shopping mall. In the face of their own uncertainty—or ignorance, perhaps—regarding consumer culture, they become outsiders in their own country and succumb to fear. Before finding the Treadwells, Jack explains, the police consulted a local psychic named Adele T., who, after performing various rituals, directed them to a mineral processing plant along the river. When the police arrived, they found a bag containing a handgun and two kilos of heroin. This discovery is in keeping with Adele T.’s track record as a psychic who, when asked to find evidence, always leads police to places where they end up solving unrelated crimes. Uncertainty once more factors into the logic of White Noise, propelling police officers to consult a psychic in a desperate attempt to escape the terror of unsolved mysteries. That they continue to use Adele T. despite her inaccuracy illustrates their delight in defeating uncertainty, even if the questions they’re answering aren’t the ones they set out to answer in the first place. In this way, answers of any kind are valued more than questions. Lannamann, Taylor. "White Noise Chapter 13." LitCharts. LitCharts LLC, 11 Sep 2017. Web. 23 Apr 2019. Lannamann, Taylor. "White Noise Chapter 13." LitCharts LLC, September 11, 2017. Retrieved April 23, 2019. https://www.litcharts.com/lit/white-noise/chapter-13.